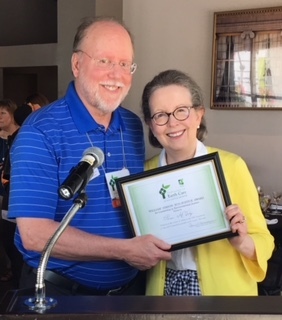 Two deserving individuals and one organization were recognized for their exceptional environmental achievements at the Presbyterians for Earth Care (PEC) Luncheon on June 19 at the 223rdGeneral Assembly (GA) in St. Louis. The William Gibson Eco-Justice Award was presented to Pam McVety, long time Presbyterian and climate activist. Sarah E. Ogletree received the Emerging Earth Care Leader Award for a young adult, and Interfaith Partners for the Chesapeake received the Restoring Creation Award for an organization. PEC’s Annual Award Winners received a framed certificate, suitable for hanging, and free registration to PEC’s upcoming national conference, “Peace for the Earth,” August 6-9, 2019 in Stony Point, New York. More about each of the award winners is below. 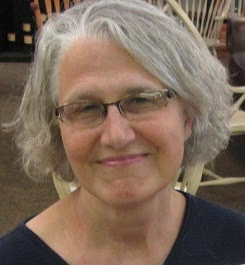 Pam is a member of First Presbyterian Church in Tallahassee, Florida where she is the chief advocate within the church for action related to stewardship of the earth and climate change mitigation. At the Presbytery level, Pam served as the Stewardship of Creation Enabler for the Florida Presbytery for over 15 years. She chaired the Energy Policy Resolution Team for the Presbyterian Church (USA) to rewrite the denomination’s energy policy in 2004-2005 and wrote and lobbied for passage of a 2006 GA resolution for Presbyterians to go carbon neutral. 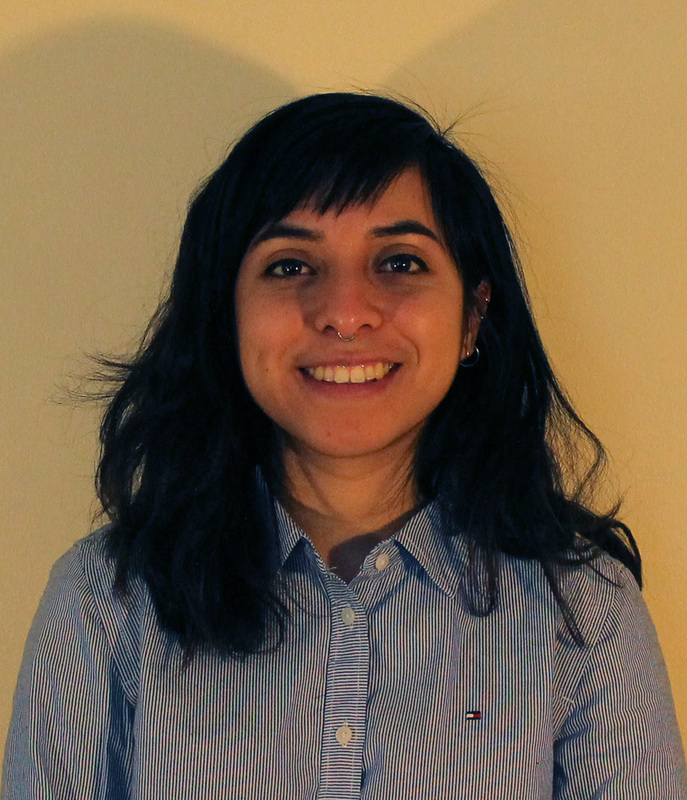 She personally worked with the Presbyterian Foundation for the creation of a Fossil Fuel Free investment option. Pam continues to stress the moral and scientific need to address the issue of climate change through testimony at commission and legislative meetings and is a frequent lecturer on climate change science. This award is one of numerous recognitions that Pam has received over the course of her 30-year public service career in state government and devoted volunteer work. 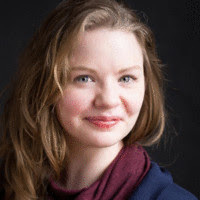 Sarah is entering her third year as a student at Wake Forest University School of Divinity in North Carolina where she will receive a Master of Divinity with a concentration in ecology in May 2019. As an applicant, she was recognized as a strong candidate who demonstrated exceptional promise in religious leadership and strong academic ability with the Jeanette Wallace Hyde Award that provided full tuition and a $5,000 annual stipend for two years. Sarah was also a co-leader of the School of Divinity’s environmental student organization. Sarah has completed internships in religious education at both Cullowhee United Methodist Church and First Baptist Church of Sylva and for the faith-based environmental non-profit, the Creation Care Alliance of Western North Carolina (CCAWNC). Sarah is also an accomplished bluegrass musician and played fiddle and sang with her husband at a benefit concert for CCAWNC that she organized. • Equip People/Communities of Faith for Advocacy: Speaking Out. Since its incorporation in 2013, IPC has grown to be an organization with a paid staff of four, that manages a half dozen on-going programs. IPC has reached 258 congregations in the Maryland-DC area since 2013 and worked with 1874 individuals, touching an estimated 42,000 people in the pews through a growing network of faith communities. These words were shared by a villager in the town of Haji Ahmed, Iraq. The past two years of his life and those living in his village were spent working to protect their land from fossil fuel companies. The land in Haji Ahmed is being used by Exxon Mobil as a drilling site. Two years ago I, and a team from the Presbyterian Peace Fellowship, met this villager when we traveled on a Christian Peacemaker Team delegation to Iraqi Kurdistan to learn more about how the fossil fuel industry was impacting villages in the Middle East. 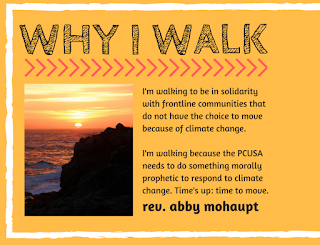 This June I will walk 260 miles from Louisville, KY to St. Louis, MO for the PC(USA) 223rd General Assembly to raise attention about the need to divest from fossil fuels. As I prepare for that journey, I am reflecting on my experience in Iraq with people and families who welcomed us alongside their journey to resist this industry for their land and lives. The extraction of fossil fuels in this region are compromising the villagers’ access to basic needs for survival. Two villages we visited had to import bottled water for drinking and cooking. Roads are controlled and closed by the companies, limiting access to hospitals and schools. It would seem that there would be help from the government to work with fossil fuel companies and negotiate considering how they are treating the villagers’ property and humanity. However, many of the companies are drilling with the blessing of the Iraqi government. The government has security teams overseeing the sites and is under contract with fossil fuel companies to make money annually. They are supposed to be compensating the villagers for the destruction of their land, but at the time of our visit no villagers had been compensated and they are not offered work. What’s more, much of the land still has remnants of war from Saddam Hussein’s regime which left landmines all along the sides of the road which are accessible to them. The villagers our delegation met with were striving to act against the fossil fuel companies non-violently. They organized and protested the companies. They met with members of parliament and advocated for their land, compensation, and for work. They resisted in every way they know how. In Haji Ahmed, the villager’s efforts did lead to Exxon Mobil’s exit from their land. However, that result was not typical of resistant efforts, nor made with a promise not to return. I journeyed alongside the villagers for three weeks, but this reality is their everyday life. The fossil fuel industry is continuing to contribute to climate change and environmental disaster, impacting those who come into direct contact with them in devastating ways. Two years ago our delegation team left Iraqi Kurdistan with a deep sense of urgency to to help eliminate this devastation and our connection to fossil fuels to the best of our abilities. Today, the resolution we thought best still stands. We need to divest from fossil fuels. Climate science consistently produces evidence of the irreversible changes that will impact our world––we need to also listen to the voices of those who are most impacted by fossil fuel extraction. These are the voices that speak truth into our present world, like the villagers in Haji Ahmed, people in the disappearing wetlands of Louisiana, and others on the margins. These are the voices telling us time is up––the time to change is now. Two years later, I have seen little difference from companies like Exxon Mobil and Dana Gas. It’s time for us, as the church, to declare that what is happening is wrong. It is our call to love God, love creation, and love people above all else. Divesting from fossil fuels will show the world that we are a church that believes this call from the Gospel and listens to the needs of our neighbor. The 1970's seem to be the time when Presbyterians became more engaged in the ministry of Caring for Creation. I am convinced that the first Earth Day (April 22, 1970) came to be from the work of Senator Gaylord Nelson. Some even say he was a Presbyterian Elder and was a motivating factor in our Earth Care mission. Let us not forget 1962 and the publishing of Rachel Carson's Silent Spring. Presbyterians began to seriously identify the Biblical foundations for earth care and to listen to the earth scientists who were describing what is happening to our atmosphere and oceans, water, soil, animals and plants, food and human beings. It seems that with the arrival of the 1980's, there was a concern that Presbyterians were not moving fast enough in the area of earth care, justice, and restoration. That concern led the Presbyterian Social Witness Policy group to appoint an Eco Justice task force to survey what the various ministry units of the denomination were doing in earth care. In June 1989 came Keeping and Healing Creation. This resource describes the environmental crisis and why and how to bring restoration. Some of the leadership to bring forth this study and to prepare for the 1990 General Assembly were Beverly Phillips (Convener), Robert Stivers, Eva Clayton, Donna Ogg, and William Gibson. Staff to the subcommittee were Dieter Hessel and William Somplatsky-Jarman. The Eco Justice Task Force and Social Witness Policy helped greatly in bringing the policy proposal: Restoring Creation for Ecology and Justice. This was passed by 97% of the General Assembly gathering in 1990. Word has it that when it was passed the Assembly stood and sang the Doxology. I would recommend that it is time to revisit Restoring Creation For Ecology And Justice, a marvelous resource! As we prepare for General Assembly in St. Louis in about two weeks, I want to direct your attention to one of the largest conversations that will be happening there. Forty presbyteries have supported Overture 08-01, On Directing the Board of Pensions and the Presbyterian Church (U.S.A.) Foundation to Divest from Fossil Fuel and Actively Invest in Securities That Focus on Renewable Energy. Forty presbyteries. Several are part of the Synod of the Northeast, which has already decided to divest from fossil fuels as a council. Quite a few of the concurring presbyteries are in coastal regions, facing new threats of potential offshore drilling. Some are in the middle of the United States, with pipelines passing through with great risk, connecting their regions to bigger port cities. A number of these presbyteries are actually in historic fossil fuel extraction regions, too. On June 1, walkers from around the country will begin the PCUSA Walk for a Fossil Free World with an Opening Worship in Louisville. Join us. From that worship service, walkers will walk between 10-15 miles a day, worship together in the evening, and learn from experts on climate change, the Bible, investments, and other topics related to divestment. You can join us on our last day on June 15 in St. Louis. But we will be working against intense institutional pressure. Mission Responsibility Through Investment (MRTI), the Board of Pensions, and the Foundation have all said that PC(USA) should continue to engage with the fossil fuel industry. Forty presbyteries, frontline communities, and former moderators of the denomination have called for categorical divestment. Time’s up to engage—the fossil fuel industry has had enough time to change their business model. (Read more at Five Things You Need to Know About Categorical Divestment). Please reach out to your commissioners to ask them to support divestment and OVT 08-01. And if you’re at General Assembly, please come and see us in the exhibit hall, testify in open hearing (email us if you need help), join us at the PEC Luncheon, the Presbyterian Peace Fellowship Peace Breakfast, or Committee 8 proceedings. Together we are for creation.